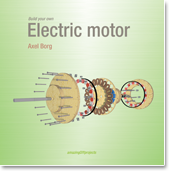 This is a practical handbook which, step by step, describes how to build a powerful electric motor the Do-It-Yourself-way. The whole building process is covered in detail with photos documenting every step on the way. A motor built according to these instructions weighs around 10 kg. The outer diameter is 366 mm, and width about 120 mm, the output shaft and threaded mounting rods/bolts not included. The maximum power input is not yet determind. The motor built in this book handles 7 kW continuously with bursts up to 18 kW without any visible damage. The motor could be used to propel a light motorcycle, a smaller boat, an ultralight aircraft and many other exciting creations. The motor is a “brushless double-sided axial flux permanent magnet 3-phase AC air core air cooled hall-effect sensor Delta connected-motor”. One unique feature is that this motor can be built in a sensorless split stator version powered by 7 R/C hobby ESCs. This split stator version can, in some applications, be an economically attractive alternative to the hall sensor version, which is normally powered by a more expensive hall sensor dependant controller. 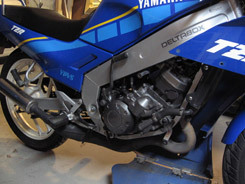 The motor build documented in the book resulted in a motor which is put to use in an electric motorcycle conversion. In the first part of the video you can se the permanent magnets position versus the electromagnet coils. The second half of the film reveals some of the problems you will face if you chose to perform dynamic test with a propeller and at the same time wish to document the test with a video camera. Experimental sensorless version of the electric motor. In this clip it is powered by 7x HobbyCity super simple 100A 24V ESC. This video shows the significantly more powerful version of the kick bike motor, about 500W. 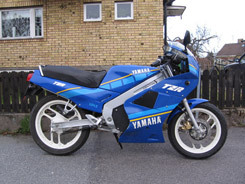 If you are interested in building this motor, you can buy a non-edited step-by-step building instruction. Simple 1 phase brushless motor. Watch more DIY electric motor videos on our YouTube channel. Maximum power test with 11 Thundersky 90Ah cells. The 7x120A ESC setup needs help to find the direction of rotation, therefore a start motor and a free-wheel sprocket is added. 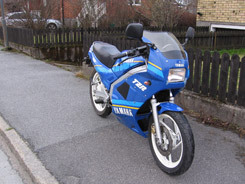 The start motor is controlled by a left side throttle handle and controls speeds up to 5-6km/h. 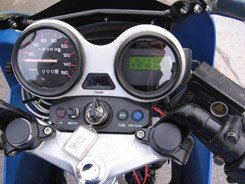 The right hand throttle handle which controls the 7x120A ESC can be used at speeds above 3-4km/h. Experimental high efficiency and high power motor. 840 parallel 0.05 mm strands, 3.9 m each. It was a bit tricky to wind the coils, the photos in the video gives you a clue on one way to do it. 3.5 m Ohm phase resistance. Kelly controller on left (hall sensor) throttle handle, and 6x 180 A peak Hobbywing R/C ESC on the right (Magura 5 k Ohm potentiometer) throttle handle. Kelly controller acts as starter motor. New aircore stator, improved cooling. 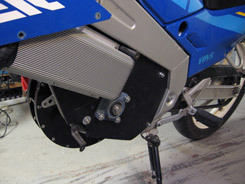 The motor build documented in the book resulted in a motor which is put to use in an electric motorcycle conversion. For more information: http://www.evalbum.com/3318. I love your work! It is very inspirational. I have one question about motor theory. As you are not using a halbach array, would your motor benefit from a steel back plate for the magnets to complete the magnetic circuit? Or perhaps you use a steel back plate? How much stronger of a field between the gap do you think you might get with steel back plates? Thanks in advance! Steel back plate reduces rpm/V for a given version of the motor with about 20%, making it possible to build an even more efficient motor; it is all in the book! I'm very interested in your DIY plans for an axial flux motor, however I would like to build one that could handle 20kW. Does your advanced design illustrated in your new developments do this? 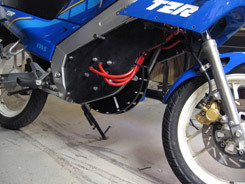 I have not tested the motor systematically in a laboratory, but rather in a real world application, namely as a traction motor in a electric motorcycle conversion. In this application the motor handles burst power of 20kW at approximately 1500 rpm. I would not expect the motor to handle 20kW at low rpm like this for longer periods of time. However, running the motor at higher rpm would make it possible to put more power through the motor without overheating it. This could be achieved in different ways, either by going for a higher voltage setup or by winding the coils towards a higher rpm/v. There is also, of course, the possibility to scale up the motor. OK, this is amazing. I have a mill, but no lathe. Is a lathe required? No, you do not have to use a lathe in this build. There are two details of the build that could be made in a lathe but it is not necessary in order to achieve a good final result. In the book you will find a rough way of calculating the right lengths of copper wire/coil to require a certain rpm/V. In general the book is a “hands on” building instruction and do not cover the underlying math. However, in the process of building electric motors I have gained a lot of practical experience which I have done my best to put into writing. While speaking of experience, an air core axial flux motor, without proper gearing, would not by my first choice for a low rpm high torque motor.